← Happy Year of the Horse! Bon Appetit Wednesday! on January 22 showcased this recipe—strategically posted between National Popcorn Day and the National Football League’s Super Bowl XLVIII in the United States—and described the relationship between the Aztecs, popcorn and chocolate. In honor of the Super Bowl being played today, we are re-posting the recipe for the football parties being held far and wide. But so you know, fans of the Denver Broncos and Seattle Seahawks may want to take a page from Aztec sporting history as kickoff approaches. It is believed that the Olmec Empire (1200 BCE – circa 400 BCE) originated the ballgame that was later played by many Mesoamericans, including the Mayans and Aztecs. The Aztec game was known as ullamaliztli and was so culturally important as to be the second construction of any new settlement after the shrine to the god Huitzilopochtli. Employing an ulli or nine-pound hard rubber ball (rubber was a common substance in Mesoamerican life), the game required using the elbows, knees, hips and head—but never the hands—in keeping the ball aloft, sometimes for more than an hour at a time. The game was played on an I-shaped court called a tlachtli or tlachco with surrounding areas for spectators and skull racks called tzompantli for sacrificial victims. 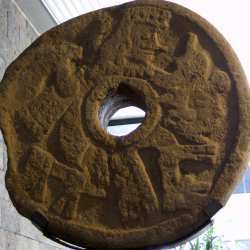 An actual ring used in the ancient Mesoamerican ball game, Ullamaliztli. It was meant to mirror the ball court of the heavens, this [the earth] being the ball court of the underworld where the sun passed each night. The game represented the battle between day and night, and so was also related to the human blood sacrifices that were intended to keep the sun moving in the sky. Today’s version of ullamaliztli is known as ulama and has a number of variations—with less carnage—in different countries. So when you dig into that bowl of Aztec Chocolate Caramel Popcorn and watch the Broncos and Seahawks battle to final victory, just think of the historical sweep of competition, politics, religion and snacks. And in the case of our Aztec popcorn delight, victory—or defeat—never tasted so sweet. *Recipe adapted from Better Homes and Gardens. Preheat oven to 300 degrees F. Remove all un-popped kernels from popped popcorn. Place popcorn and pumpkin seeds into a 17x12x2-inch roasting pan. Keep warm in oven while preparing caramel. Butter a large sheet of foil; set aside. For caramel, in a medium saucepan combine brown sugar, butter and corn syrup. Cook and stir over medium heat until mixture boils. Continue boiling at a moderate, steady rate, without stirring, for 5 minutes more. Remove saucepan from heat. Stir in baking soda and vanilla. Pour caramel over popcorn mixture; stir gently to coat. Bake for 15 minutes. Stir mixture; bake for 5 minutes more. Spread popcorn mixture on prepared foil; cool completely. In a small saucepan combine chocolate, shortening, ancho chile pepper, coffee powder and cinnamon. Cook and stir over low heat until chocolate is melted and smooth. 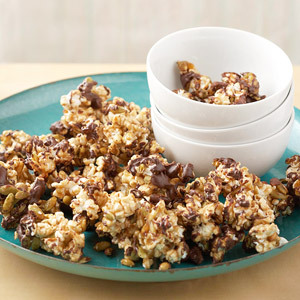 Drizzle chocolate mixture over popcorn mixture; if desired, toss gently to coat. Let stand at room temperature or in the refrigerator until set. Break mixture into clusters. Spoon into gift container. *Note: To roast raw pumpkin seeds, in a 15x10x1-inch baking pan combine 1 cup raw pumpkin seeds (pepitas), 2 tablespoons olive oil and 1/2 teaspoon salt; toss gently to coat. Spread pumpkin seeds in a single layer. Bake in a 350 degrees F oven for 10 minutes, stirring once halfway through baking. *Make Ahead Instructions: Place popcorn in an airtight container; cover. Store at room temperature for up to 1 week. Orr, Heather (2005). “Ballgames: The Mesoamerican Ballgame”. In Lindsay Jones (Ed.). Encyclopedia of Religion. Detroit: Macmillan Reference, Vol. 2. pp. 749–752. 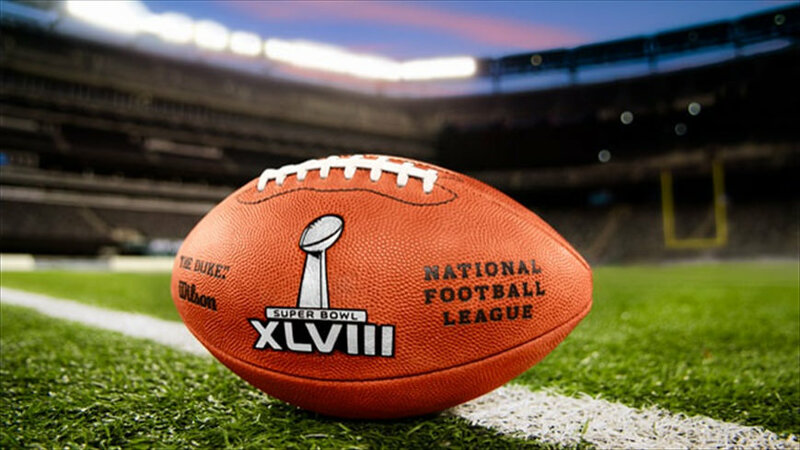 This entry was posted in Blog, Culinary, Culture, Holidays, Public Life, Recreation, Sports and tagged American football, ancient history, AntiquityNOW, Aztec, Mesoamerica, Olmec, sports, Superbowl, ullamaliztli. Bookmark the permalink.